Toshiba has just announced a new Windows 10 convertible called the DynaPad, that shares more than a passing resemblance to the Microsoft Surface — but it’s lighter, thinner and likely a good bet for anyone who needs to use a stylus. 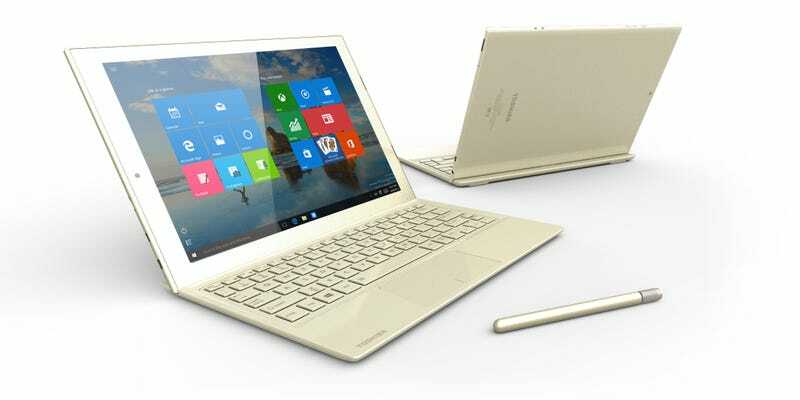 The new 2-in-1 features a 12-inch 1920 x 1280 IPS display, with anti-reflection and anti-fingerprint coatings. But when it comes to the touchscreen, the real selling point is the bundled Wacom Active Electrostatics TruPen, which offers 2,048 levels of pressure and works with Microsoft’s pre-installed Office and Edge software, along with Toshiba’s own, too. Toshiba claims that the hardware replicates the feeling of writing on paper with a real pen — which is likely a bit of a stretch, but Wacom’s stylus is certainly one of the best there is. In terms of spec, the device features a 1.44 GHz Atom processor and 4GB of memory, so it may not be quite as zippy as a Surface — but it is certainly a little less bulky. Without its keyboard, the tablet weighs 569 grams and measures 6.6 millimeters deep; with the keyboard, those figures increase to just 996 grams and 14.9 millimeters. There’s no firm word on pricing yet, but Verge reckons it should cost in the region of $1,000 before tax.